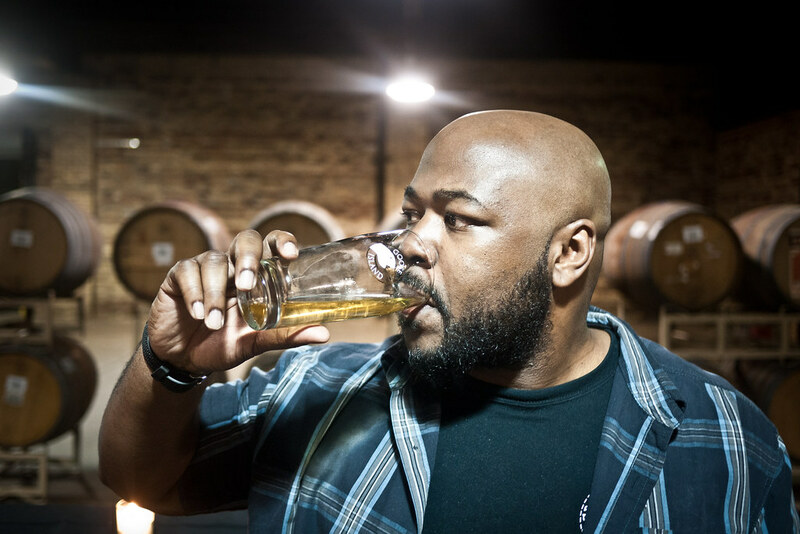 Nkosi White (@chibeergeeks) is co-founder of the popular craft brew blog Chicagobeergeeks.com. He’s been fighting for the craft beer movement for some time, and recently we got a chance to sit own together and discuss the fruits of that labor at a special Revolution Brewing dinner. He’s also charter member of DrexTLC — a partnership with Drexel Properties that promotes education and civic pride through a series of events and workshops for youth in South Shore. But like many of us, he’s mostly busy trying to convince his mom that a craft beer blogger isn’t a new type of alcoholic. I really enjoy sours, belgians and saisons. We cover a ton of events, and they’re always a refreshing departure from the endless IPAs, stouts and barelywines on display at most festivals. I really dig the fact that a well done sour or gueuze, served in a proper glass, can really change the perception of the casual beer drinker — especially those of the female persuasionthat “don’t drink beer” or “prefer wine over beer.” A few of my favorite beers right now are the Long Thai Rainbow Rye from Half Acre (thai peppercorn saison aged with honey and raspberries) and the Cantillon Classic Gueuze. Zombie Dust, Southern Tier Choklat and Argus Pullman Palace Car IPA. There were a few moments. I think it was the Brewmasters Collection from Sam Adams that caught my attention about 7-8 years ago. Thats when I paid attention to the numerous different styles available in beer, and how well beer went with food. The trips to Whole Foods for bombers of Unibroue’s beers or Brother Thelonious by North Coast in ‘05 definitely changed my palette. But I think it was the daily commute via Metra from Chicago to Lake Forest and back that changed me the most. My buddy Angry Johnny and I would grab Dreadnaught by 3 Floyds, then hit the upper level and make friends. Those days morphed into us pursuing rare and tasty beverages as a passion project. Summer 2011, an event at the Village Tap called the Local Tap Takeover — 26 Taps all local breweries. It was a regular Thursday night at a neighborhood bar, but there was an electricity in the air that was hard to explain. I think the beer community coming out in full force is what made it so special. In one corner there was Greg Hall sipping Zombie Dust, Argus VP of Sales in another corner. Hopcast was there, our friend Brenden from the Wild Onion Brewery crew (the concept was actually his idea), Ben Finch, Lincoln from 3 Floyds, Jess from Metropolitan, the CHAOS homebrew club, Tom Korder from Goose Island. It was beautiful, we take so much pride in our local beer scene. Seeing everyone so excited about an all-Chicagoland taplist was special. Very few nights were as fun as that one. As a brewer you get to create beer recipes. That’s almost like creating music. You could do that as a bartender if you were a mixologist, but I’m not much into mixed drinks. I say Brewer. It was probably at Farmhouse Tavern in River North this past fall. I have close ties to a powerful non-profit a block from there (www.icstars.org). I’m always a craft beer advocate, bringing new beers for everyone to try. The crew was convinced that Founders Canadian Breakfast Stout, a beer not on the menu, was available at Farmhouse. Not only did we score CBS but, we enjoyed the only keg of Contessa IPA in the city. For an added bonus we were introduced to the brewer of this Italian pale ale from Birra Amiata who just happened to be in town, as well as Don and Wendy from Vandberg & DeWulf. Those two were once owners of Ommegang. It sparked this amazing conversation about import beers. The night ended with the bar manager giving us a facility tour, and sharing a bottle of bourbon barrel aged mead from Wild Blossom on the south side. The tables had turned, my friends were taking me on an epic beer voyage for a change — one of my all time favourite hunts. Black Tuesday from The Bruery in Orange County, CA.